So how did Gurley more than triple his TDs and add 881 yards of total offense? He only saw 22 more touches, so "Usage" wasn't the answer. Yet, his efficiency spiked from 3.77 yards per touch to over 6.1. Why? Indeed, Andrew Whitworth helped stabilize and beef up a weak offensive line. Robert Woods, Sammy Watkins and Cooper Kupp all added firepower outside. But none of these "Surrounding Talent" upgrades are true "game-changers." No longer will the impact of new coaching be overlooked! YES! I want a huge leg up! Past Player Production: Lists that illustrate player trends under particular coaches -- target hogs, bell-cows, or committees? How targets will shake out between Josh Gordon and Jarvis Landry under Todd Haley, and why both should top 1,000 yards? 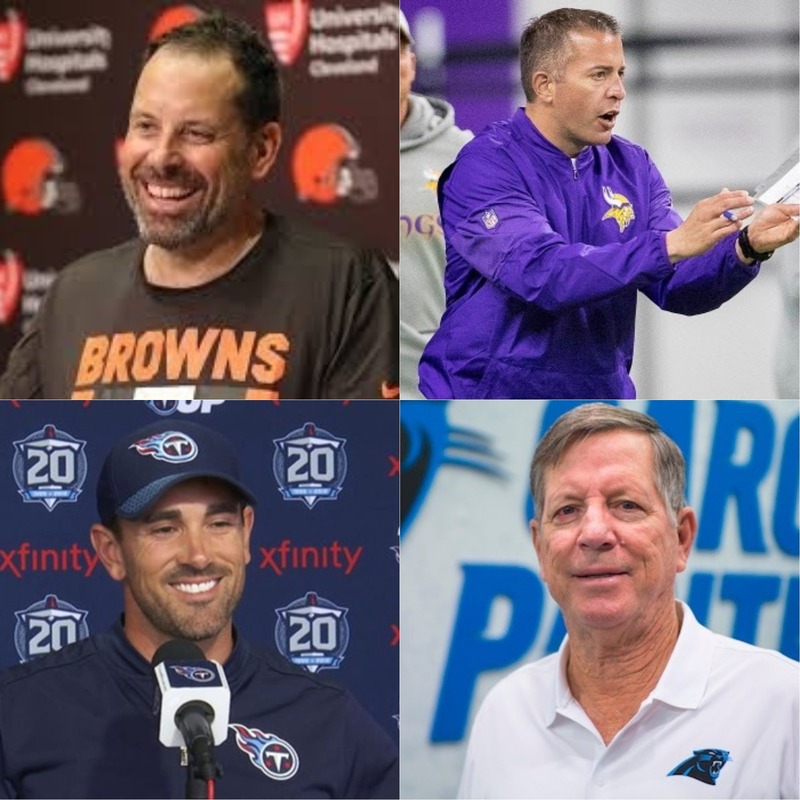 What to expect from Marcus Mariota, Corey Davis, Dion Lewis and Derrick Henry now that they're free from "Exotic Smashmouth"
Yet, one of the most crucial, and easily the least covered, is Coaching Scheme. 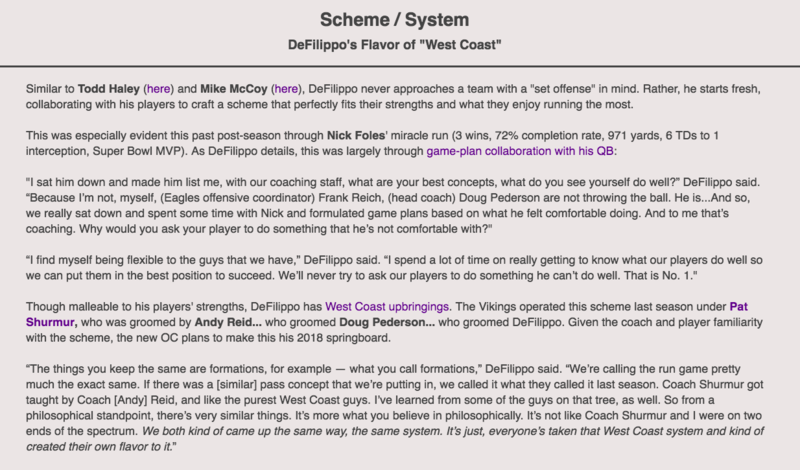 Coaching Scheme plays an enormous role in fantasy fortunes. It not only dictates how an individual player will develop and be used, but also how well an overall team will perform. 1) Creativity - does the playcaller attack and threaten defenses in unique ways? 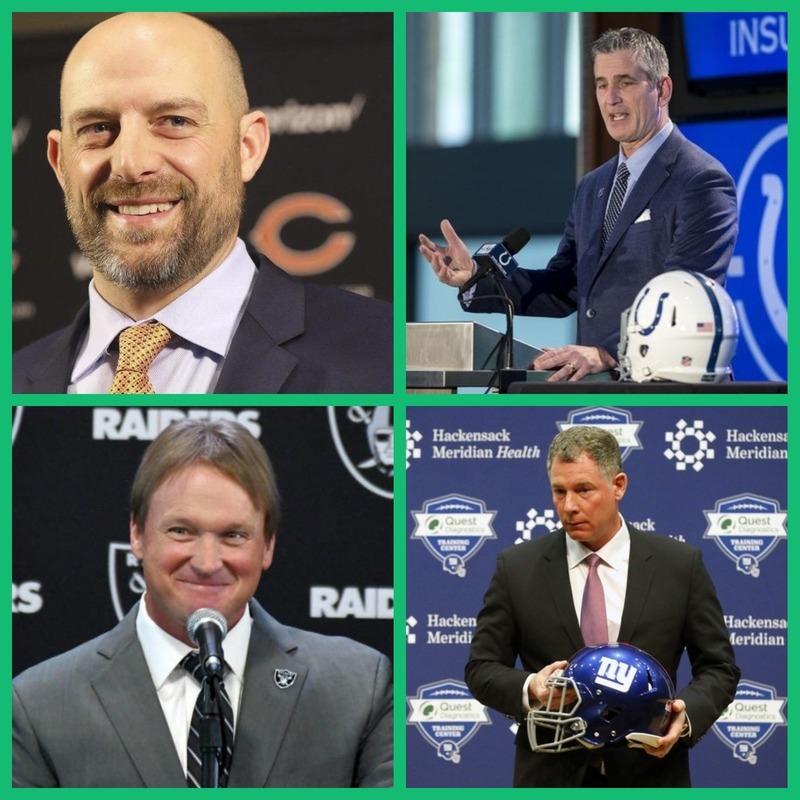 (John DeFilippo) Or is the offense vanilla, dull, and easy to shut down? (Jeff Fisher). 2) Aggressiveness - is the playcaller willing to go for the home run? Will they keep their offense on for 4th downs and constantly sustain drives? (Matt Nagy). Or is the coach detrimentally conservative, capping the scoring ceilings of his talent (John Fox). 3) Talent Management and Development - Does the coach elevate his players' talent to the next level? Can he scheme around his players' strengths and skillsets (Todd Haley)? Or does he force square pegs into round holes, forcing ill-fitting talents into miscast roles? As Gurley illustrates, a major change in the Coaching Scheme can be ENORMOUS for Fantasy Football Value. 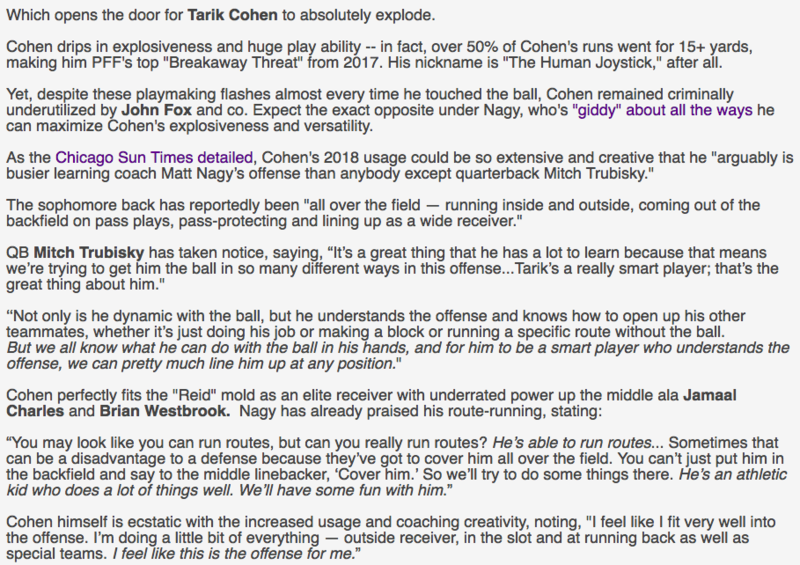 Great articles and totally agree, this guy is going to really get the Vikes offense rolling. NFC North is shaping up to be a shootout style division... I put a lot of stock in coaching moves each season while most overlook it. Keep these articles coming. Can't wait for the Guide." Love this stuff. Never seen anyone dive this deep into coaches and their history. 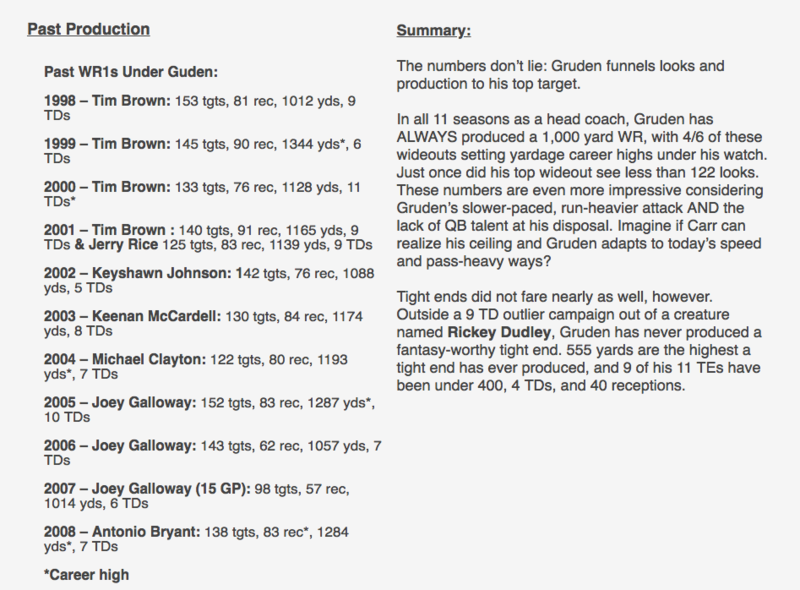 Todd Haley to Browns has me reconsidering all my keeper decisions after seeing your info and what it means for Josh Gordon. As a true fantasy nerd, this stuff gives me some real Fantasy Wood. Got Kamara last year because of your breakdown on Sean Payton and his history of pass-catching backs... won that. Excited to find the next one this year." 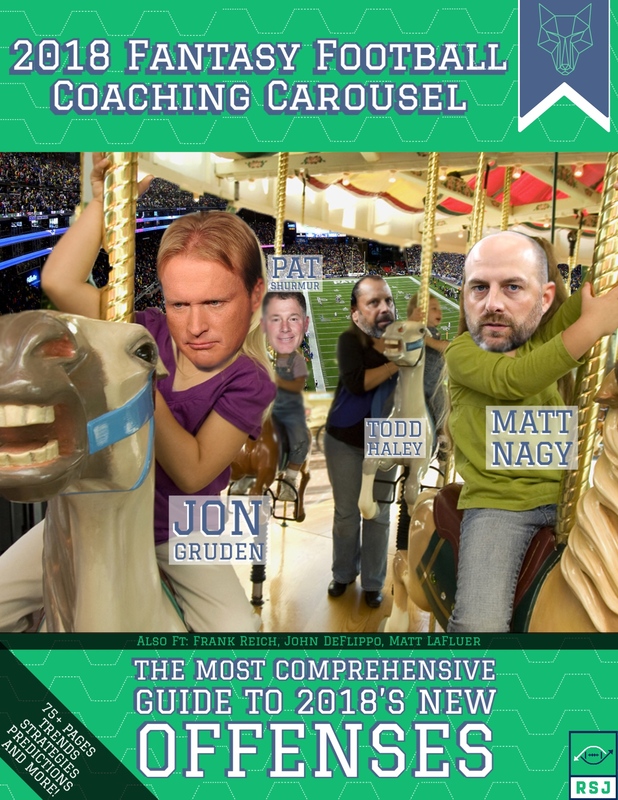 Grab Your 2018 Coaching Carousel NOW!